Not all who wander are lost. Meet 21-year-old Rohith S who personifies the immortal words by JRR Tolkien. 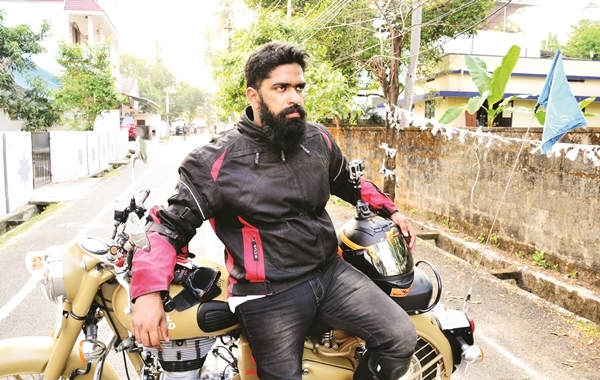 When the odometre on his Royal Enfield struck 3,000, the Chennai lad set out from his hometown on a 1,00,000 kilometre road trip that would take him all through India and South East Asia (via the new India-Myanmar-Thailand highway) before reaching Europe. Two weeks into the trip, he reached Kochia��after riding through Puducherry, Kanyakumari and Alappuzha. a�?I am riding in an attempt to forge universal brotherhood, kindle the spirit of adventure and, more than anything, to prove that you can see the world even if you are cash strapped,a�? he begins. Cashing in Rohith had set the wheels in motion in 2013, when he launched fundmydream.in, a crowdfund sourcing platform. Through this, he later launched his project, The 25 Million Metre Ride, promising backers priority access to his travelogues, including a documentary titled, After all its your Life, and a coffee table book featuring the best 100 photographs from his journey (hea��s carrying his trusty digicam and a Go Pro for the shoot). The effort helped raise Rs 6 lakh and soon brands including The Wicked Ride, Wrangler and Ustraaa��sponsoring the maintenance of his beard throughout the tripa��stepped in. But the plan wasna��t without roadblocks, as the Myanmar inland permit cost a steep Rs.A�3.5 lakh. So, instead of hotels, he bunks with friends and acquaintances along the way and survives on Rs 100 a day (excluding fuel). a�?I dona��t ride just for pleasure, I also make a living on the road through social media product plugging, blogging and my vlog on #fame,a�? explains the young entrepreneur, who is heading to Goa next, via Kozhikode. If the roads are forgiving, Rohith will reach London (the last point on his trip) by July 2017.